This week’s helpful technology for personal healing and development is the Iphone and IPad App called Chakra Box. 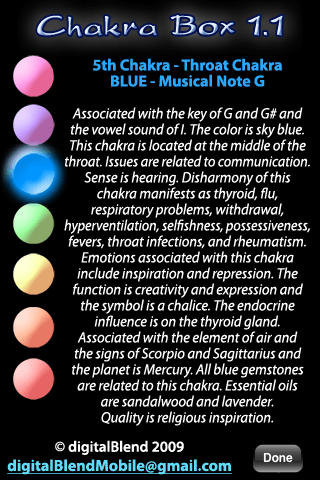 The Chakra Box plays a series of tones that tune your chakras. 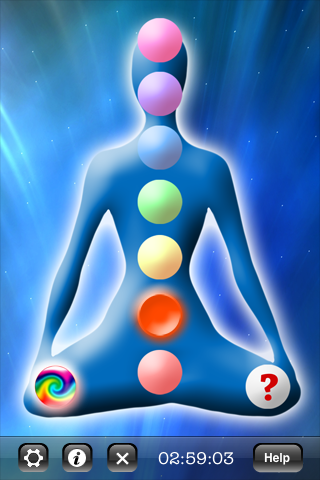 Upon loading the app, you will see an interactive silhouette of a meditating person with the seven primary chakras as buttons. The easiest way to use the app is to simply press on a chakra and hear a Tibetan bowl sound meant to balance and clear negative energy. The sounds for each chakra are harmonized according to what sound each chakra requires for balancing and opening your chakras. We found the sound quality to be quite excellent. If you wish for a nice hands off approach, you can set the bowls to up to eighteen repetitions. 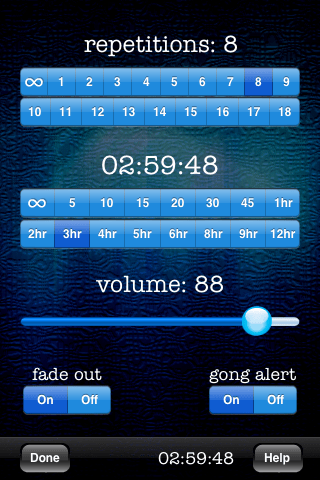 The timer allows for up to twelve hours of continuous playing time so you can meditate hands free or even sleep while enjoying the benefits of the app. At 2.99 it’s not a bargain, but it’s not unreasonable or unaffordable. If you’re a traveling Reiki practitioner or yogi looking for a portable and simple way to use chakra sounds without carrying a set of bowls with you, the ability to program the sounds to play works very nicely during both classes and private sessions. If you are new to meditation, chakras, or sound healing and looking for an easy way to start your learning process, the app includes a basic write-up about each of the chakras and their meanings. Overall we wish the price was slightly lower because it may be overlooked by those more comfortable with a .99 or $1.99 price point. Chakra Box really is a wonderfully simple and helpful app both for those who want to dip their toes into meditation, or sound healing- or for practitioners looking for another tool for their tool belt.